Dinner and Bikes is coming up fast. We’re all in the midst of getting ready to head out from our respective cities, packing, partying, dealing with last minute logistics, and of course putting the finishing details on all our events. Here’s the full list of them. One of the best things about this tour is the way each city and organizer makes Dinner and Bikes their own. Sure enough, events are all starting to develop their own personalities. Our kickoff event in Morristown, NJ on June 1st is less than two weeks away—it’s a classic one, held at a bike shop. In between we’ll be at churches, art galleries, and historic buildings, in a trolley museum, a real estate office, and a range of event spaces and community centers. We’ll close things out in Miami on July 3rd at a place called Gramps Bar. Good times will be had. In Brooklyn alone, at the very beginning of the tour, we have two back to back events that are about as different as they can be. On June 2nd, Dinner and Bikes is a formal affair at the Old Stone House. $50 tickets gain you entry to an outdoor gala event benefiting Recycle-a-Bicycle. You’ll be entered to win a raffle for a Van Moof or Brooklyn Bicycle Co. steed. You’ll enjoy family-style dining while you take in an inspiring and controversial talk by Elly and some short films by Joe. Then on June 3rd, we’re at the 3B bed and breakfast. Tickets are $15 and include a yoga class if you’d like to come out early. Dinner will be served buffet style and you’ll enjoy a screening of Joe’s new documentary, Aftermass (and some of Joshua’s spicy popcorn if we’re lucky). There’s something for everyone — or come to both. The final pieces are falling into place for the upcoming East Coast Dinner and Bikes tour proper. Thursday, May 8: Aftermass movie screening in Oakland! 8:30pm, PLACE for Sustainable Living (1121 64th St). Tickets $10. Optional: Ride there together from the Bike Happy Hour (leaving at 8pm)! Saturday, May 10: Meet and Ride with Elly Blue—Elly’s book Everyday Bicycling is the book of the month at the Oakland Public Library. Optional ride leaves from the Chavez Branch at 10:15; her talk is at noon at the 81st Ave branch. Wednesday, May 14: Dinner and Bikes San Diego. We’re reuniting with chef Joshua for this one. Dinner is served at 7pm at La Bodega Studio and Gallery (2196 Logan Avenue) Optional guided group ride leaves at 5:30pm. Tickets (purchase here) are $15 for BikeSD members, $25 for nonmembers. Thursday, May 23: Aftermass screening back home in Portland. 7pm, $7! Clinton Street Theater (SE Clinton & 26th). Comments Comments Off on California pre-tour events! Dinner and Bikes gets a little better, a little more fun, and a lot more organized every year. The 2014 tour has already seen some exciting innovations. We completed a successful Kickstarter project that will help us bring the tour to cities we wouldn’t otherwise be able to visit. Also as a result of this extra funding kick, we’ll be able to add organic, local vegetables to our buffet. And this year, instead of a flaming rental car, we’ll travel between our events in a waste vegetable oil tour van from Fossil Free Fuel in Braddock, Pennsylvania. Huge thanks to all the backers who made this possible, as well as to our local hosts and the event sponsors we haven’t met yet. We’ll be seeing you soon, and we can’t wait! We are also thrilled to announce a new team member: This year we’ll be joined by Ruby, a 17 pound Public Access Certified medical alert dog, who is joining us as Joe’s personal assistant and all around advocate for the joys of both bicycling and food. Our schedule is starting to fill in, but there are still options to add events on all legs of the trip. Take a look, and get in touch if you’d like to talk about bringing us to your town. Comments Comments Off on Tour booking has begun! We’ll be doing another Dinner and Bikes tour in 2014. We’re hoping to cover the entire US eastern seaboard … and we’ll have a whole lot more awesome books, ideas, and recipes. Other than that, we don’t know much yet. The tour could be in April or June or even later in the summer. It could span three weeks or six. We could be in another rental car, or finally figure out how to manage it on the train. It’s totally up in the air. Do you live on or near the east coast? Want to help us bring an event to your town? It’s not too early to get in touch. Our kickoff event was at the super friendly Velo City bike shop in downtown Holland, Michigan. This weekend kicks off Tulip Time, which means a gorgeous flower display everywhere and a ton of foot traffic on main streets, including many people wearing full Dutch costume! It was quite a scene. The event was lots of fun. Our organizer, local bike advocate Meika Weiss, wasn’t sure how many people would be excited about the event, but it ended up selling out, with about 50 smiling people talking about bike routes and riding bikes with kids on Holland’s not always bike-friendly streets. Aaron and others took some photos which you can see on the Facebook page for the event. We’re off to Grand Rapids tonight (we have a total of six events here in Michigan! )—and onward from there. True to form, Elly is still scrambling to use every moment of Internet connection to organize a few more last minute dates—will something come together next week in Rochester? Sure looks like it. Can’t wait! Hope to meet a lot of you along the way. Check out our schedule and come eat, talk bikes, and enjoy. 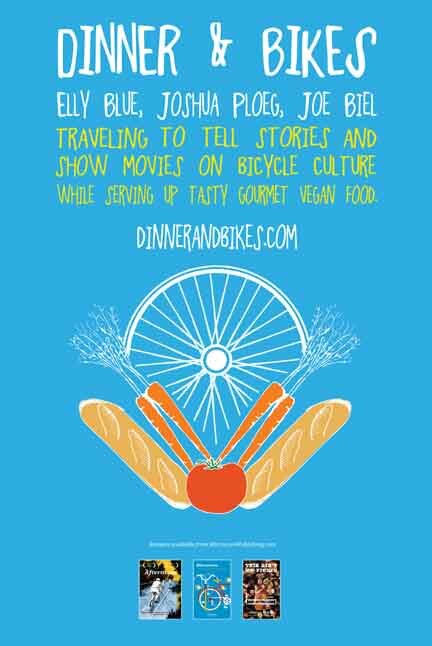 The Dinner and Bikes tour of 2013 is coming up fast — this week has been a flurry of emails, and filling in details on our schedule. A bunch of the event have ticket sales info… and we are quickly adding facebook pages for each of them. If you live or know anyone in any of the towns on our route, please rsvp and spread the word. We still have a few gaps! (Ahem, New York, Chicago…) Anyone want to leap in? Some of our best events have been put together on very short notice (24 hours was the shortest — in 2011 we packed the living room of a medium-sized San Francisco apartment. Two weeks was more than enough time for seriously stellar organizers to attract crowds of over a hundred in Santa Monica in 2011 and Jacksonville in 2012…). – Holland, Michigan has a mini-interview up with Elly. – People often ask what our usual type of venue is, and we have no answer to this. Case in point: In Columbus, Ohio, our event will be at what the owner described to us as “the city’s only vegan dive bar, I think.” We believe it! Thanks, Hal and Al’s, for hosting us. If you stick around after our show, you can see a metal band perform. – Meanwhile, our events in Syracuse and Schenectady are both hosted by the Unitarian Church. Lots of love. – It’s probably unlucky to say things like this, but I (Elly) am going to go ahead and predict that our hugest events in terms of turnout will be… wait for it… Detroit… and… Iowa City. I’ve been wrong before plenty of times (Joshua is our resident savant at this guessing game, which is good because he does the grocery shopping), so other cities should feel empowered to go ahead and break my prediction. See you all very soon! We can’t wait for each and every one of these events.